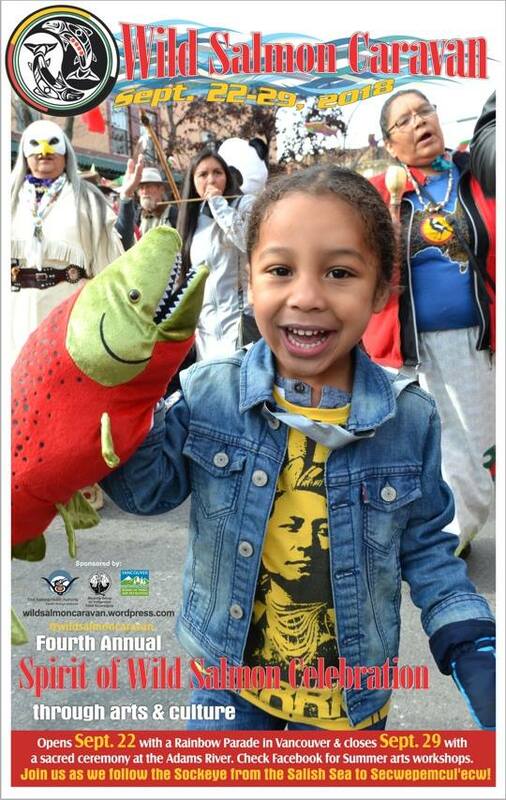 It's the 4th annual Wild Salmon Caravan and the dominant run of the sockeye. Come join the caravan and swim them home! We travel together to honor and celebrate the spirit of wild salmon. Along the way we will share knowledge, wisdom, and values that highlight some of the most sustainable wild salmon fisheries that have persisted since time immemorial. This year the Wild Salmon Caravan is grateful to hosted by Coast and Interior Salish communities- Musqueam, Tsleil Waututh, Skwxwừ7mesh Ủxwumixw - Squamish (Vancouver) Stờ:lõ -Schwa:y (Chilliwack) St'at'imc – Xwisten/Bridge River, Lillooet Nlaka’pamux – Shulus/Lower Nicola Indian Band (Merritt) Secwepemc te Adams Lake, Neskonlith, Little Shuswap (Chase and Kamloops). The following file is a 103 KB jpeg image.